The Model BL-2 is a versatile, tail pulse generator capable of simulatingthe outputs from a wide range of detectors, photomultiplier tubes, and relatedelectronics. It offers good linearity and stability, and fast, narrow pulsecapability. Having a broad range of rise and decay times, the Model BL-2 can simulate the shorter pulses of plastic scintillators and lead glassas well as the longer pulses of NaI, many liquid scintillators, and amplifier outputs. The Model BL-2 enables the user to check electronics for linearity, resolution, rise time effects, count rate effects, and overload effects. 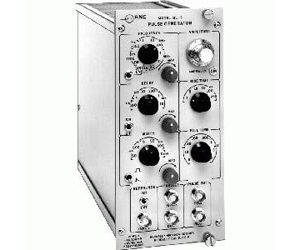 Of particular interest to those that wish to check pulse pair resolution and count rate effects is that the BL-2 can operate in a double-pulse mode, with a pair of pulses havingan adjustable separation that can be as low as 10 ns. Since repetition ratesare variable to 50 MHz, a 100 MHz repetition rate is possible by double pulsing. The high repetition rates enable the user to quickly accumulatethe large number of counts needed for good statistics.